***all competitors must be ready for their event and buckled up. Event officials will not wait for any drivers in any phase of the event – NO EXECEPTIONS! 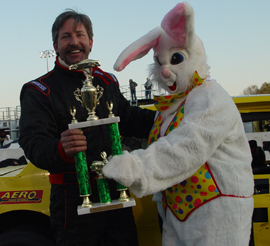 Welcome to the second annual Easter Bunny 150 at Hickory Motor Speedway. The Pro All Stars Series officials would like to thank you for your participation. Due to unusually cold weather, event officials have changed the schedule. Please be ready at all times. 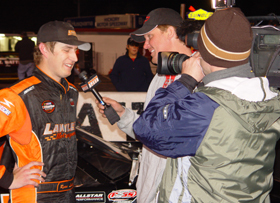 Saturday, 10:40pm ET - Ryan Lawler won the second annual Easter Bunny 150 to start out the 2007 PASS South Super Late Model season. Lawler was strong in the second half of the event with his crate-motored ASA Late Model. The young Texas driver made his Super Late Model debut in this same event one year ago. Ben Rowe came back from a flat tire to finish second. Tim Nooner started out his year with a fine third-place run. Johnny Clark, Dean Clattenburg, Heath Hindman, Dale Shaw, John Batten, Chris Dunn and Shane Riffel rounded out the top 10.
have all unloaded. This brings the total number of registered PASS South entries for the weekend to 37. There could still be an addition or two as well. More trailers are lined up to enter the pit area, but it is unclear which one belong to SLM teams or which ones contain cars for the support races. 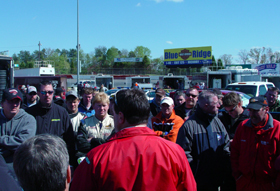 Saturday, 11:00am ET - The pit gates are just about to open for the Easter Bunny 150 at Hickory Motor Speedway. The second annual event will kick off the 2007 PASS South season as the main course with Pro Challenge, the Allison Legacy Series and Redneck Racers serving as support events today. There were 33 PASS South Super Late Models in the pits yesterday for an optional practice day. Today, there will likely be some addition and a little bit of subtraction. A few more cars are expecting to sign in, while Brian Payne has loaded up his #41 after a hard wreck in the first turn. Payne was uninjured, but the same could not be said for his car. The team has withdrawn from the race weekend. Saturday, 12:40pm ET - There is a healthy car count for all of the races that will make up the Easter Bunny 150 event. 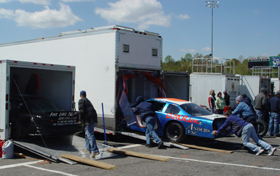 In fact, there are so many trailers set up here that a few late-arriving Pro Challenge, Allison Legacy and Redneck Racer teams have had to set up in a makeshift overflow pit area out in the Hickory Motor Speedway parking lot. Saturday, 12:35pm ET - In practice on Friday, Corey LaJoie spun and backed his #44 Super Late Model lightly into the backstretch wall. The team reports that they have rewelded the rear bumper brackets after the incident, but when the car hits the track for practice today, it will be as good as new. "It's not a good feeling when you lift off and she still wants to keep going like that," said WIlliams, who was not injured. The team is hard at work repairing the right front corner of their chassis. Williams said that if the team can round up some body panels, they might be able to have the car on track for this afternoon's heat races. Saturday, 2:10pm ET - In the second practice session of the day for the PASS South Super Late Models, Corey Williams hit the turn three outside wall, causing heavy damage to the right front of his #47 machine. The car is currently being towed back to the pit area. Williams does not have a back-up car, but if his primary car can be fixed he does have a very qualified crew to do it. Williams, a crew member for the Busch East team of Andy Santerre Motorsports, has a few of his fellow co-workers here to help out this weekend, as well as Brian MacDonald from the Germain Motorsports NASCAR Craftsman Truck Series team, and several crew members from his PASS North team of last season. The #89 of Lee Hansard also spun during this practice session, but did not hit anything. Saturday, 1:55pm ET - The Redneck Racing Series is known to feature plenty of action whenever their competitors hit the track and their first 10-minute practice session was no exception. First, the pink #6 wagon "Trouble" got loose and spun in turn one, then the #1 "Chowderhead" entry locked its brakes up in turn one without hitting anything and then the #84 "Vigilante" started blowing a large amount of smoke out of its right side stacks. It didn't seem to slow driver Rusty Drye down any though. The Super Late Models are now lined up to go back on the track for their second practice session of the day. Saturday, 1:45pm ET - John Batten's Super Late Model team has a back-up car on their trailer, but they have made no effort to unload it yet after his backed his primary #48 car into the fence during PASS South practice. The damage to that ride appears too severe to repair in time for the heat races. We'll keep you posted on what the team is up to. Meanwhile, the Pro Challenge and Allison Legacy Series have both completed their first practice sessions of the day without incident. The Redneck Racers are now hitting the track for practice. Saturday, 1:25pm ET - Only 13 PASS South Super Late Model teams took laps during the first 20-minute practice session of the day and one of them probably wishes that he stayed in the pits. John Batten backed his #48 into the outside wall between turns one and two to close out the session. The #48 suffered fairly heavy rear end damage, but was able to be driven back to the pits. Mike Rowe and Johnny Clark were getting ready to go out on the track when the incident occured. SInce the red and black flags were displayed, they missed out on turning any laps. Corey Williams and Allen Gordon appeared to take the most laps in the session, bringing their cars in for several adjustments. The Pro Challenge cars are now on the track. Saturday, 1:15pm ET - We're 15 minutes into the first practice session of the day for the PASS South Super Later Models and only four cars have taken to the track during the session so far - Corey Williams, Allen Gordon, Greg Boone and Ryan Lawler. Saturday, 12:55pm ET - With this being Easter weekend, Johnny Clark had a bit of a hard time when it first came to lining up crew members to go to Hickory. Only one of his regular crew members could make the trip from Maine. 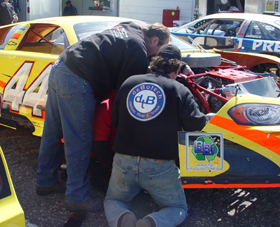 However, the #54 team won't be shorthanded. 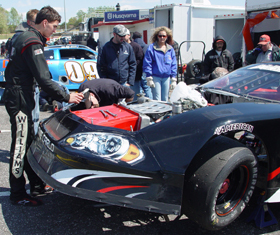 Clark enlisted the help of fellow PASS North car owner Jay Cushman and former standout Super Late Model driver Jerry Babb (who now works for the Wood Brothers Racing NASCAR team) to help turn wrenches for the weekend. Saturday, 4:55pm ET - John Batten's team has unloaded their back-up car. Batten did not make it on the track in time for qualifying, but is hoping to be ready to go for the heat races. Saturday, 4:50pm ET - Time trials are complete and eight drivers are locked into the starting field. Preston Peltier set fast time and was followed by Ben Rowe, Corey Williams, Mike Rowe, Johnny Clark, Ryan Lawler, Alex Fleming and Dean Clattenburg. Williams' run was very impressive after his team rebuilt the right front corner of his car after a practice crash. The team finished their repairs moments before time trials took place. Dean Clattenburg and Johnny Clark will be the first two drivers in the qualifying order. The #89 of Lee Hinsard has been withdrawn from the event. Saturday, 4:00pm ET - Two teams who had incidents during practice will have different outcomes when it comes time for qualifying. Corey Williams' team reports that they have been making repairs and "will be there" in time for qualifying. Meanwhile, Corey LaJoie's team reports that his #44 Richard Moody Racing car is "going on the trailer" with heavy right front damage. double fill restarts will be utilized once again. Officials also announced that the "lucky dog" rule is back this year. Saturday, 3:40pm ET - The final practice session for the PASS South Super Late Models in now complete. Cassius Clark led the way with a fast lap of 14. 908 seconds. He was followed on the speed charts by Brad Biscoff, Preston Pelltier, Ryan Lawler, Dale Shaw, Chris Dunn, Dean Clattenburg, Mike Rowe, Johnny Clark and Heath Hinman. Saturday, 3:30pm ET - Corey LaJoie wrecked in turn two during the final practice session for the PASS South Super Late Models. There is a moderate amount of damage to the right front of his #44 Richard Moody Racing machine. Rob Stevens also spun during the session, but did not hit anything. 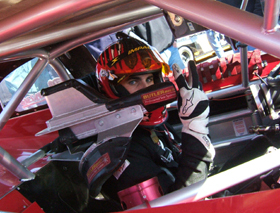 Saturday, 3:00pm ET - A pair of Maine drivers paced the first two Super Late Model practice sessions of the day on Saturday. Corey Williams [who wrecked in the second session, see below], set fast time in the first practice. His best lap was 14.840 seconds. Williams was followed by Allen Gordon, Ryan Lawler, Brian Scott and Preston Pelltier. In the second practice session of the day, Cassius Clark was the quickest with a lap of 14.935 seconds. He was followed by Brian Scott, Ryan Lawler, Johnny Clark and Dean Clattenburg. 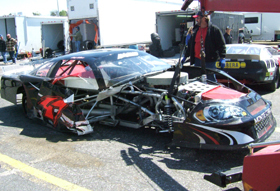 their racecar after a hard crash in the second practice session. WIlliams reports that his throttle stuck at the end of the backstretch, leading to a crash in turn three. left to take time are Mike Rowe, Brian Scott, Derek Ramstrom, Tim Nooner and Brad Biscoff. The cold temperatures is making the process of getting heat into their tires for qualifying a challenge for teams. Dean Clattenburg spun on his warm-up lap, but didn't hit anything, thanks to his cold rubber. Saturday, 4:15pm ET - In the final practice session for the Allison Legacy Series, Taylor Truett crashed hit #5 car hard coming out of turn four. His car suffered major damage, but Truett walked away uninjured. Saturday, 4:10pm ET - The PASS South Super Late Models are lined up and ready to go for Easter Bunny 150 qualifying. The field will be set in a few different ways. The top eight cars from time trials will be locked in, with a dash race deciding their exact starting order. After that, three heat races will take place with the top five finishers in each one advancing to the 150-lap feature. Another three cars will advance through a consolation race and then two provisionals will be available to PASS licensed teams. The starting grid will consist of 28 cars. Mike Rowe and Johnny Clark played a little bumper tag while battling for their positions late in the race. They also showed their displeasure towards each other on the cool-down lap. Corey Williams' up and down day in continuing. He started third in the dash, but he finished eighth after dropping out on the first lap. Williams' #47 lost power coming to the green flag and coasted back to the pits. His team is now working on the car to get it fixed in time for the feature race. Next up is the 50-lap Pro Challenge race. Saturday, 6:00pm ET - Mark Gibson won the third PASS South heat race over Heath Hinman, Shane Riffel, Tab Boyd and John Batten. Those are the five drivers who will advance to the feature race. The dash race to decide the top eight starters is up next. Saturday, 5:55pm ET - Chris Dunn won the second PASS South heat race over Tim Nooner, Randy Gentry, Dale Shaw and Derek Ramstrom. Those are the five drivers who will advance to the feature race. Saturday, 5:45pm ET - Allen Gordon overcame a very loose, a somewhat wide, racecar to lead the first PASS South Super Late Model race wire-to-wire. Gordon held off a determined Cassius Clark, who had to settle for second place. Brian Scott, Brad Biscoff and Greg Boone also advanced to the Easter Bunny 150 feature through the first heat race. Saturday, 5:15pm ET - Marty Arender won the pole for the 50-lap Pro Challenge feature race. He was followed in qualifying by Dean McIntyre, Trevor Farbo, Nick Stroupe and Jonathan Chandler. Saturday, 8:25pm ET - The finish to the Allison Legacy was a wild one. Nicholas Pope and Michael Cooper crossed the finish line nearly side-by-side, with Pope taking the win and Cooper slamming the frontstretch wall. Ryan Glenski finished third with Josh Butler taking fourth. Brandon McReynolds got caught in the wreck and also hit the wall. Everyone was okay. Saturday, 8:20pm ET - There has been plenty of action leading up to tonight's Easter Bunny 150 PASS South Super Late Model season opener and we'll bring you up to speed. Bobby Wallace may be driving the "Off Duty" car, but his was sure punched in during the 25-lap Redneck Racing Series feature. Wallace took the lead on lap 11 and drove away from the field to take the victory. The "Tow Mater" of Dave Knight " finished second by a country mile with Rusty Drye's "Vigilante", Kirby Allen's "Impact" and Bob Dillner's #51x rounding out the top five. The sixth through tenth finishers were Ken Deese's "Big Show", Paul Sparrow's "Invader", Russell Simpson's "Chowderhead", Matt Drye's "Trouble" and Chris James' "Rocket". The 12-car field was rounded out by Todd Bradburry in "Superman" and Sam Nail's Blackwidow. In the PASS South consi race, Mark Reedy, Larry Pollard and Joe Mattress took the final transfer spots. Currently, there are 12 laps to go in the Allison Legacy car race. So far, Nicholas Pope has dominated the race in his #26. The PASS South cars are lining up on pit road for their feature race, which will take place immediately after the Allison Legacy car feature. Saturday, 7:00pm ET - Kyle Mitchell won the 50-lap Pro Challenge feature with his #26 machine. He was followed to the finish by Devon Hahn, Dean McIntyre, Terry Horak and Jonathan Chandler. At this point, the results are unofficial. The PASS consi race and the Redneck Racing Series feature are the two races up next. Saturday, 6:15pm ET - Ben Rowe will start on the pole for the Easter Bunny 150 after winning the dash race in his #4 Richard Moody Racing machine. Following Rowe on the starting grid will be Preston Peltier, Dean Clattenburg, Ryan Lawler, Alex Fleming, Johnny Clark, Mike Rowe and Corey Williams. 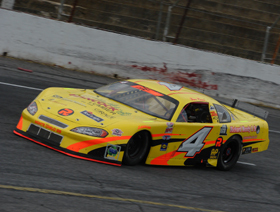 Saturday, 9:40pm ET - It's halfway in the Easter Bunny 150 PASS South season opener at Hickory Motor Speedway. Ryan Fowler is currently leading over Johnny Clark, Ben Rowe, Preston Peltier and Brian Scott. Cassius Clark has visited the pits several times for a mechanical problem. He kept plugging along, but has now pulled on pit road and shut his car off. Alex Flemming has dropped out of the race. Tab Boyd has spun, but is still running. Saturday, 9:00pm ET - The Easter Bunny 150 is underway with 19 laps in the books. Preston Peltier led early, then Ben Rowe and now it's Peltier up front again under caution. Rowe is second with Dean Clattenburg, Ryan Lawler and Johnny Clark round out the top five currently. Mike Rowe is out of the race. He slowed on the backstretch with an apparant mechanical problem and then Mark Gibson ran over him, ending both of their days. Mark Reedy and Larry Pollard are also out of the race. Rob Stevens, Dale Shaw and Derek Ramstrom have been involved in spins, but are still running. Corey Williams pitted early for a mechanical problem, but has come back out and gotten three "lucky dog" passes to march his way back through the field. 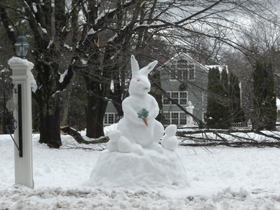 Saturday, 8:35pm ET - The Easter Bunny 150 is about to begin. Here are a few pre-race notes - Rob Stevens in the #26 and Chad Martin in the #84 were awarded the two provisional starting spots. Corey Williams' team have replaced a broken axle from the dash race and he's ready to roll from the eighth starting spot.